For tech service providers, consulting companies and web agencies, IT outsourcing is a strategic decision to save costs without sacrificing quality. However, finding a reliable and flexible outsourcing partner that can fit in with your already existing processes without creating overlap is a difficult task. As an alternative to working with an IT outsourcing service provider, Pentalog has implemented a simple and efficient BOT (Build, Operate, Transfer) model that allows you build and manage your very own outsourced unit. This model is especially designed for IT companies and web agencies, it consists of an easy to follow turnkey process that can be used to create your own nearshore or offshore development unit in Romania or Vietnam. This model allows you to set up your team in the build phase and then take them for a trial run during the operate phase. Once you see that the team is well adapted to your company’s processes, methodologies, and tools you can decide to purchase and take full control of the team in the transfer phase. Using the BOT model allows you to try before you buy, meaning you do not need to make any long term investment in an offshore unit until you are sure of its value. With over 25 years of experience in IT outsourcing, a global team of 1,000 engineers as well as a talent pool of 400,000 profiles managed by our partner, SkillValue, we provide a safe, reliable, and cost-effective option for creating your own offshore or nearshore development team in Romania or Vietnam. Building your team using our BOT model will help you overcome the shortage of high-quality tech talent by giving you access to cutting-edge skillsets. It will also help you tackle challenges related to employee turnover rates, team flexibility, and unoptimized production costs. Through the Build-Operate-Transfer engagement model, our clients are able to gain a headstart without having to invest a lot of resources launching their project, recruiting a team, or setting up HR branding initiatives. We take charge of all of the management and recruitment aspects of your project and offer our support throughout the entire process. We set up teams that have mastered the full stack of software development and DevOps best practices. 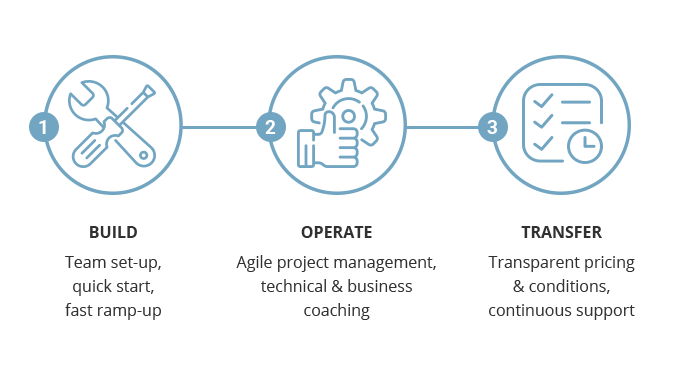 We apply Agile methodologies to build your dedicated offshore or nearshore team in Romania or Vietnam that you can then acquire and make part of your internal workforce. By the time you take ownership of the team we will have transformed it into a cohesive and experienced unit that shares your values, vision and business culture. The BOT process is fully transparent. Pricing, transfer conditions, and the terms of collaboration are all 100% visible so you have all the information you need before we even begin the build phase. During the operate phase it is not just Pentalog who supervises your team, you will also have full access to the team and can build up their skills, employ different management techniques, and integrate your company’s culture. When you decide to take ownership, the team will already be mature and operational. Once the BOT process is complete, ownership of the team is transferred entirely to you and you can operate your outsourced unit as you wish. If requested, Pentalog will continue to provide assistance with administrative management, accounting, recruitment or any other services related to your outsourced team even after the transfer of ownership. 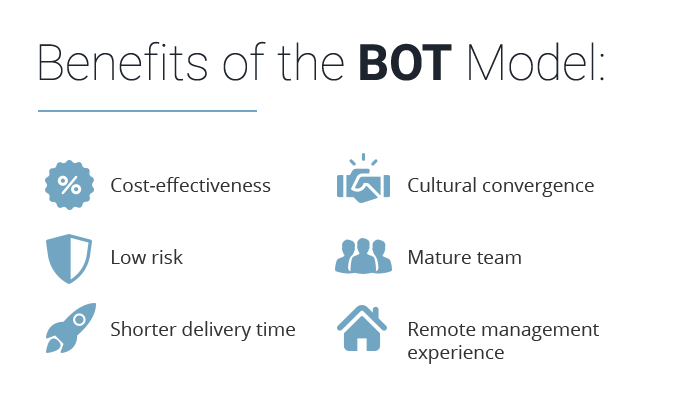 Use Pentalog’s BOT model to build up your business and lower costs, making you more competitive in a tight market. Explore all of the benefits of setting up an outsourced business unit in Romania or Vietnam.